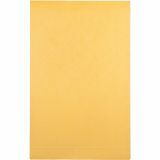 Tear-resistant Kraft paper is designed for maximum durability and protection. 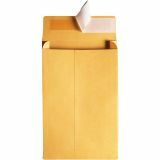 Whether the contents are intended to be a surprise or confidential, the opaque brown color inhibits visibility from anyone but the recipient. 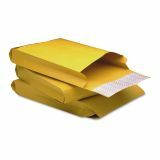 Quality Park Redi Strip Kraft Expansion Envelope, 9 x 12 x 2, Brown, 25/Pack - Expansion envelopes offer security for bulky mailings with a 2 expansion gusset for extra-thick mailings. 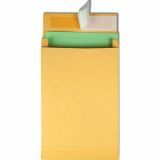 Great for computer reports, catalogs and binders. Large end-opening allows easy document insertion. Convenient Redi-Strip closure requires no moisture to seal. Simply peel away the liner and seal. 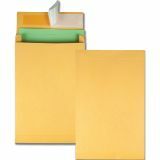 Envelopes are made of a durable, 40 lb. Kraft." Extra heavyweight 40 lb. 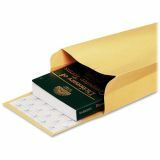 mailers expand up to two inches to fit larger items or documents for shipment. Features a Redi-Strip® closure. 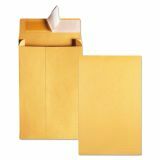 Perfect for mailing bulky documents or binders.